PLEASE SHARE THIS POST ON YOUR SOCIAL MEDIA PAGES! I wanted to make sure this message got out. It has shown on Petaluma360.com and Petaluma Patch. It has also been shared on various social media. The Petaluma Downtown Association provides the following. Lindsay Lugo is a wife, a mother of two small boys, a Petaluman, and a new business owner (Home of the Chicken, located at 131 Liberty St., Ste B-2). 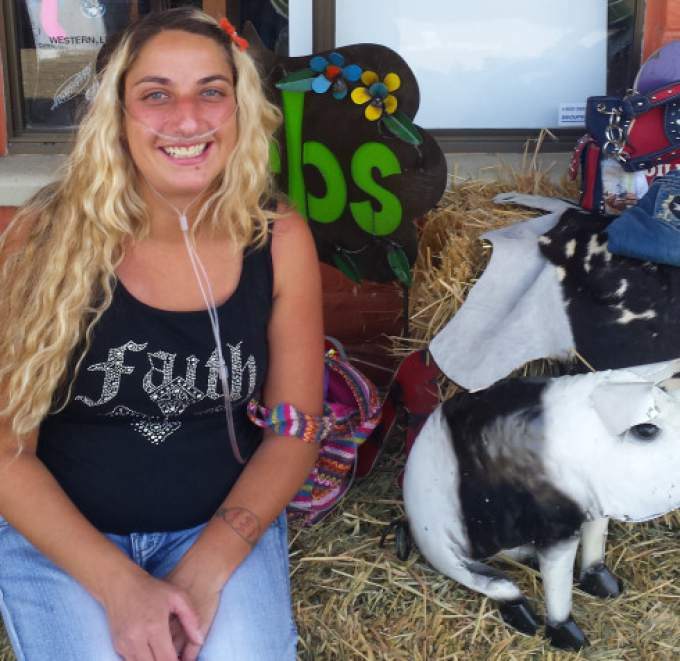 She also suffers from a rare and incurable lung disease called Pulmonary Hypertension. While there is no cure for this debilitating disease, there is hope to extend her life and her time with her family, through a double lung transplant at University of San Francisco Hospital. She is currently next on the waiting list for her blood type, which is wonderful news! But, that being said, there are still people ahead of her for the universal donor blood type of O and having 74% stage 2 antibodies means that only about 26% of donors are a match for her. This is an expensive and daunting procedure and Lindsay and her family need our wonderful community to step up and help support them in their time of need. 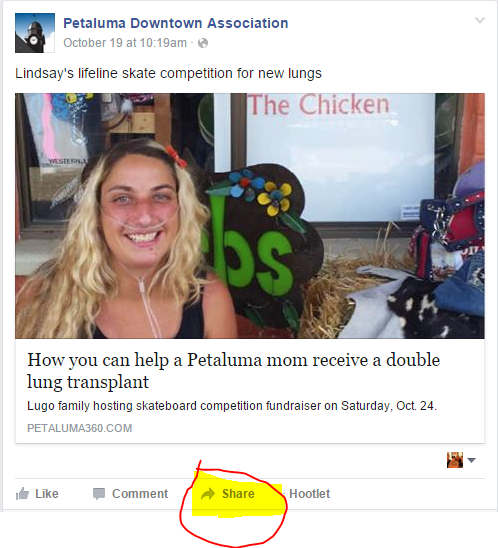 1) PARTICIPATE THIS SATURDAY: To that end, Lindsay and her husband Angelo have put together a fundraiser fueled by their passion for skateboarding, called “Petaluma Hot Chicken Skate Competition” to be held on Saturday October 24th starting at 1:00PM the Petaluma Skateboard park near the fairgrounds. It will be a family friendly event for skateboarders and spectators of all ages to come out, have some fun, and help support her cause. Pro skaters will be there signing autographs. There is a $10 entry fee to compete for prizes. 2) CONTRIBUTE RAFFLE PRIZES: There will also be a community raffle, with tons of great gift certificates and prizes donated by local businesses (see list below for all the generous businesses that have donated to this cause already!). And that is where YOU come in! If you can contribute prizes, gift certificates, or gift baskets, it would be very appreciated. With over 100,000 needed for her medical expenses, any donation of any denomination is helpful and appreciated. You can purchase raffle tickets now at Home of the Chicken (131 Liberty St.) and Flower Child Consignment (123 Kentucky St.) as well as on the day of the event. Raffle tickets are $2 each or $10 for 6. 3) DONATE MONEY: If you can’t make it or help with raffle – no worries – you can help by donating directly to Lindsays Lung Transplant Fundraiser Go Fund Me page gofundme.com/lindsaylugo. 4) HELP GET THE WORD OUT: It’s is great that people “Like” this post but it really does little in helping to spread the word. What will really help this Petaluma Mom is if you SHARE this post on Facebook (or retweet it on your twitter, etc…). The average person has around 200 facebook followers. If you SHARE the post — rather than Like it — your post is then shared with your followers, so they can share it to 200 other people and so on. This has a exponential effect in getting the word out to as many people as possible. Click the social media icons below to do this now. Won’t you share this post? Any questions, donations, or words of encouragement can be directed to Lindsay or Angelo at Home of the Chicken, 707-782-6392.